Apologia Educational Ministries is a forerunner in producing curriculum to help our students form a biblical worldview. This worldview is of utmost importance in our homeschool, probably one of the top reasons we choose to homeschool is to encourage this way of thinking. Apologia continues to strive to meet the needs of our homeschool. What on Earth Can I Do? $39, geared for grades 1-6 (with some flexibility). This is the fourth book in the series What We Believe. 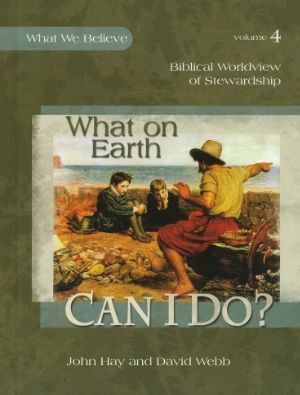 The book takes a look at biblical worldview and stewardship. I used this study with my 10 year old niece who is very new to the faith. I wanted to give her more than just showing scripture passages to memorize. I wanted to show her how God is at work in our lives and has been in the lives of people in the past. I also included my 9 year old daughter and 6 year old son in the study. I would read the book to them according to the lesson plans in the notebooking journal. This book contains quite a bit of history as it shows God being the creator of the earth and using people in History to show examples. What on Earth Can I Do? 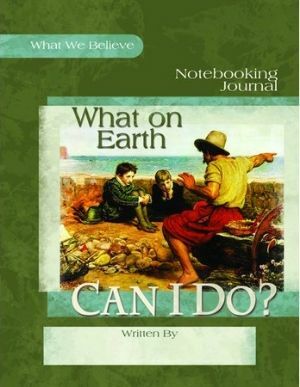 Notebooking Journal $24, goes along with the hardback book of the same title, engaging the student in learning to put God first while doing activities that go along with the reading. I love the lesson plan in the front of the book that tells us which pages to read in the hardback book as well as what corresponding pages to do in the workbook. Makes it much easier for the teacher. Each lesson has 2-4 pages in the notebooking journal to use. I love that their are questions in the notebook that ask the student to recall some of the reading from the hardback book. This helps me to make sure they are listening while I read. There are a few days where I had to read quite a few pages in the study and I wanted to make sure that I didn't 'lose' them during it. Knowing they would be 'tested' helped them to pay better attention. The student includes vocabulary, word finds and searches, copying scripture, answering questions in more of an essay style format, and putting mini books together. No coloring pages in this journal, so if you have a child who is a great writer, and loves to color I would recommend purchasing the coloring book as well! What on Earth Can I Do? 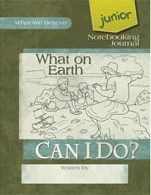 Junior Notebooking Journal $24, is designed for the younger grouping of students or those with limited writing skills. Typically used for ages 6-9. This notebook includes coloring pages as well as some basic writing skills. Writing activities include learning new vocabulary, crosswords, word finds, copying scripture, and freely writing and answering questions. The book also includes mini books at the back to correspond with some of the lessons. The Junior notebook really is a great product for getting the younger ones doing more than just listening, but being actively engaged in learning more about how they can minister to others. What on Earth Can I Do? 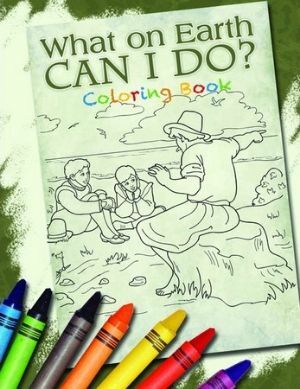 Coloring Book $8, was a great tool to use for my K student. It got him involved in listening to the book while I was reading, and give him something to keep his hands busy. This surely helps share a Christian Worldview with even our younger students. The quality of the coloring book is outstanding. Great, thick pages and beautifully illustrated pictures. Eight Lessons in What on Earth Can I Do? 1. Your Story or God's Story? 2. Who put you in charge? 3. Will you be found faithful? 5. Where does your time go? 6. Whose life is it anyway? 7. Why isn't it easy being green? 8. What will happen when the master returns? The lessons can be covered in approx 2 weeks for a 16 week course. The book has some great examples of historical figures like Corrie ten Boom, Winston Churchill, Dietrich Bonhoeffer, and many you haven't even heard of.. all making a difference in the kingdom of God. This is an excellent series and I hope to have my young children do each of the 4 in the series. I think it will better prepare them to have a biblical worldview and allow them to minister to others the truth of the gospel message. See what my Crew mates thought of this series by clicking on the link below.